In a funk over Trump? Cynicism, for instance about startling turns in global affairs, can be toxic. 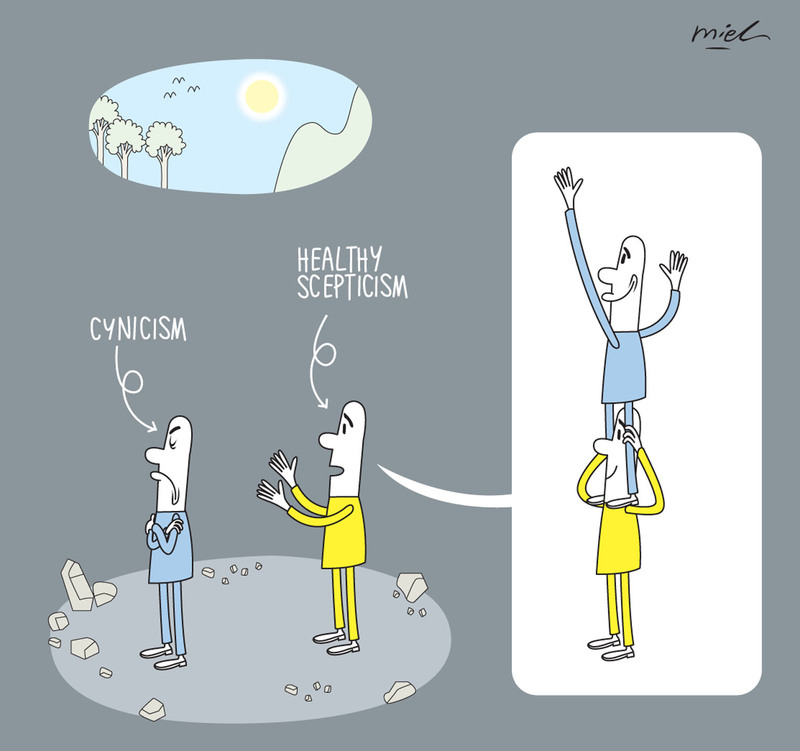 A dose of healthy scepticism is a much better approach. Trust is an important foundation in interactions between people, and this applies in relationships between friends, employee and employer, or citizens and the government. At the government level, recent surprise world events, such as Brexit, when Britons voted to leave the European Union, and last week's election of anti-establishment figure Donald Trump to the United States presidency, suggest a disruption of that foundation of trust. One challenge from such a turn of events is the rise of cynicism. A cynic thinks that everything that others do is motivated by their self-interest, that people do good only to seek personal glory or as a calculated investment to reap some material gain. The cynic also believes that people will lie to get ahead and exploit others when they can get away with it - that people cannot be trusted to say what they mean and mean what they say. Research has shown that cynical individuals are more likely to experience stress, anger and other negative emotions. They are also more likely to have adverse social, mental and physical health outcomes including poor interpersonal relationships and a higher risk of burnout and cardiovascular illness. Studies have identified leadership behaviours that can prevent cynicism or mitigate its effects. Leaders should seek feedback from the people and take them seriously, increase transparency of the decision-making process, share relevant information that explains the situation, treat people fairly and with dignity, see things from their perspective, and take action to enhance people's well-being. However, in contrast to the many studies on managing others' cynicism, there is much less attention given to how to identify our own cynicism and address it ourselves. For our well-being, it is important to know if we are developing, or have developed, an attitude of cynicism, and how to move out of it. We may lament that many people not only get away with poor performance, but always get credit for things done by others. Or we may complain that we never get rewarded for the things we do, but always get blamed for what we do not do. Other telltale signs of cynicism include when we don't bother to give suggestions to improve things, because we don't think they will be adopted. Or when we think it won't lead to the desired outcome because the people implementing them don't know how to, don't care enough, or both. Sometimes these negative beliefs are justified because they reflect the reality of the situation. But if these beliefs persist, repeat themselves across different issues or situations, and expand to include generalisations about people we do not know well or have never interacted with, then chances are cynicism is taking root. Cynicism is harmful to both others and ourselves. It destroys actual and perceived goodness through three negativities. The first is conspiratorial beliefs. When the cynic adheres to a conspiracy theory, he believes that events are secretly manipulated for some hidden goals that serve a group's interests. Although often lacking in objective evidence, a conspiracy theory can be widely accepted. Conspiracy theories are captivating because their explanations tend to be elaborate and coherent, giving detailed accounts of secret goals and motivations, how the events came to be, and even the plans for future manipulated events. Like a plot in an entertaining drama, when shared widely and talked about enough, a conspiracy theory not only becomes highly popular, it becomes a convenient lens through which one might make sense of past, present and future events, regardless of the actual facts. The second negativity through which cynicism operates is confirmatory bias. We selectively seek out and interpret information to confirm rather than falsify our preconceived ideas. We spend time with like-minded individuals who share our beliefs. Confirmatory bias partly explains why, when we believe in a conspiracy theory, it develops readily, and appears coherent and convincing to us. The theory is highly resistant to change because we find that it repeatedly gets supported by new observations, when they are in fact filtered and coloured by what we chose to see. No one is immune to confirmatory bias, but it is found in abundance in the way that the cynic processes information. The third negativity is counterproductive behaviour. Cynicism is not just about thoughts and feelings - it is also characterised by actions. A classic action is withdrawal. The cynic withdraws from participation in collective life, often beginning with coming late for meetings or events, and then skipping them altogether. Another is retaliation, ranging from spreading rumours to acts of sabotage. The cynic sees these acts as justified responses instead of wrongdoing. Withdrawal and retaliatory behaviours are counterproductive because they have adverse effects on others and self. Over time, the cynic will be ostracised or countered by negative actions. A negative spiral develops, and the destructive consequences of cynicism increase in severity. Conspiratorial beliefs, confirmatory bias and counterproductive behaviours are contagious and mutually reinforcing. This explains why cynicism develops rapidly, persists over time, and is resistant to change. To prevent us from falling into the trap of cynicism, or to get ourselves out of it, we need to acquire the habit of healthy scepticism. This is doubt that is based on evidence. It is similar to the curiosity and rationality that underlie scientific progress, as well the practical wisdom that advances individual and societal well-being. Healthy scepticism is constructive because it involves critical thinking, competing tests and conditional trust. Here are some concrete steps towards becoming a healthy sceptic. Treat what you doubt as a problem to be solved using critical thinking. In healthy scepticism, doubting is part of the problem-solving process, not the solution. Start with doubt and use it as a tool in the journey of discovery. Ideally, the end goal is to replace doubt with certainty or increased confidence about the truth or falsity of what is claimed. Test competing theories. Begin by clarifying the reasons for decisions or why things were done a certain way. Evaluate the argument behind a claim using basic rules of logic. Focus on the facts to compare and contrast different possibilities to explain the events that occurred, views expressed or positions taken. Be context-sensitive - consider the practical realities of the situation, which involve both constraints and opportunities. In the presence of reasonable arguments and reliable evidence, turn doubt into conditional trust. Conditional, because it is not full faith no matter what has happened or might happen. In fact, complete trust can be maladaptive. Trust in organisational, community and political leaders is conditional. It is based on experience and evidence, which provide the reasons to believe in the leader's competence, integrity and benevolence. That is why trust in leaders is always dynamic and conditional, and high trust level at any point in time must never be taken for granted. Instead of lamenting low trust levels, or demanding high trust, we should learn to embrace and encourage healthy scepticism among those we are responsible for or care about, and earn their trust. Ignoring their doubts or suppressing their questions will surely lead to harmful cynicism when it could potentially develop into healthy scepticism. It is not possible, and actually also not desirable, to be free of cynical moments. At times, adopting a temporarily cynical view in the absence of clear facts is understandable, and may even be necessary to protect ourselves from harmful situations. But a life full of cynical moments is toxic, and a guarantee of misery. Some people may find it challenging to restructure their cynical world view. But most of us will benefit greatly from having healthy doubt based on reason and evidence. This will pave the way for effective functioning and well-being for ourselves and others, be it in citizen-government relationships, workplace interactions or our private lives.